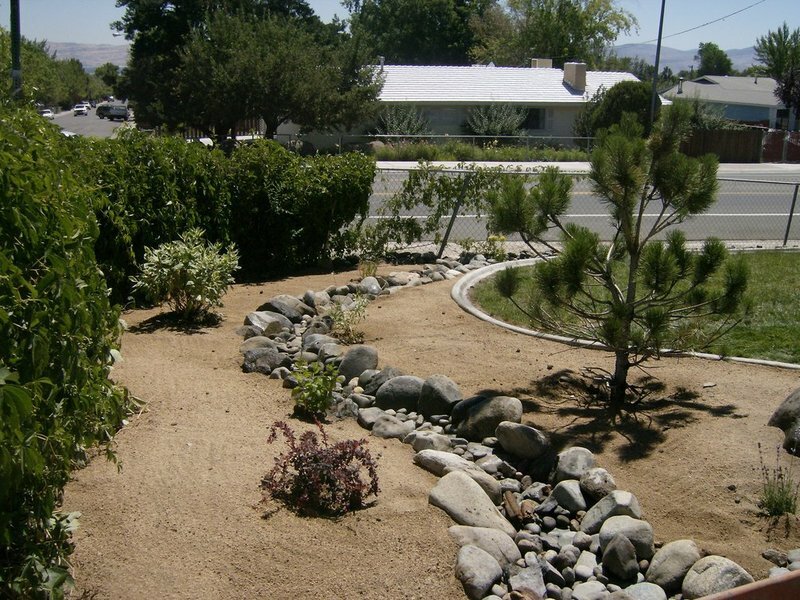 Dry creek landscaping is the perfect way to spruce up your home’s yard and unused outdoor space. It allows you to be creative and have fun, while improving the aesthetic of your home at the same time. 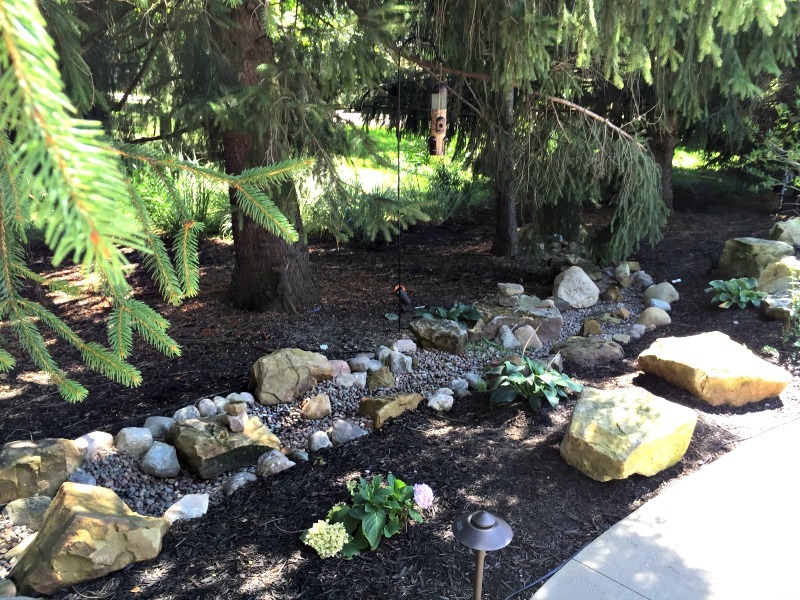 If you’ve ever considered trying your hand at dry creek landscaping, you know that before you start you need to have some sort of inspiration. To get your creativity going, here are a few beautiful examples of land that has been customized and decorated. 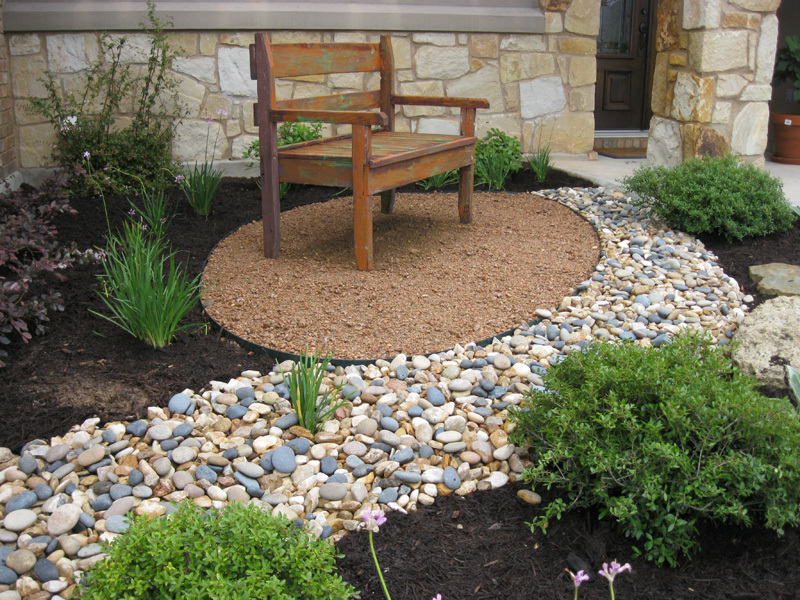 This charming dry creek landscaping idea is simple and practical. While strolling through your garden, you may get tired and want to rest. Luckily, there’s a conveniently (and elegantly) placed bench that is clearly marked by a path of white and grey stones. The contrast within this landscaping idea stands out in any backyard. The full path of white, black, and grey stones are eye-catching, and when paired with the stark brown -almost black soil- , and stunning yellow plants, this garden stands out from the rest. There’s something to be said about the classic feel of a white stone path. 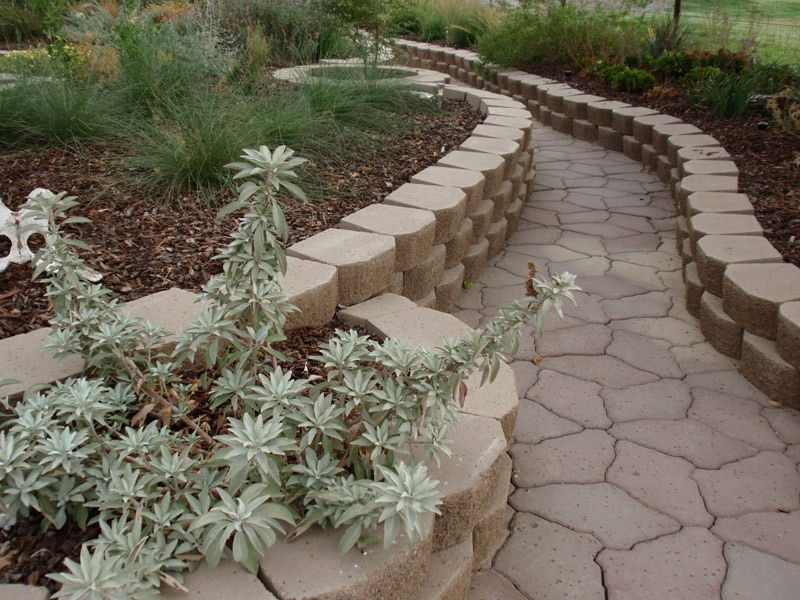 In this example, the dry creek bed path of large white stones is lined with lush green plants that grow delicate flowers. The path is curved and leads away from the house and off into the distance. This time consuming set up is truly a sight to be seen. 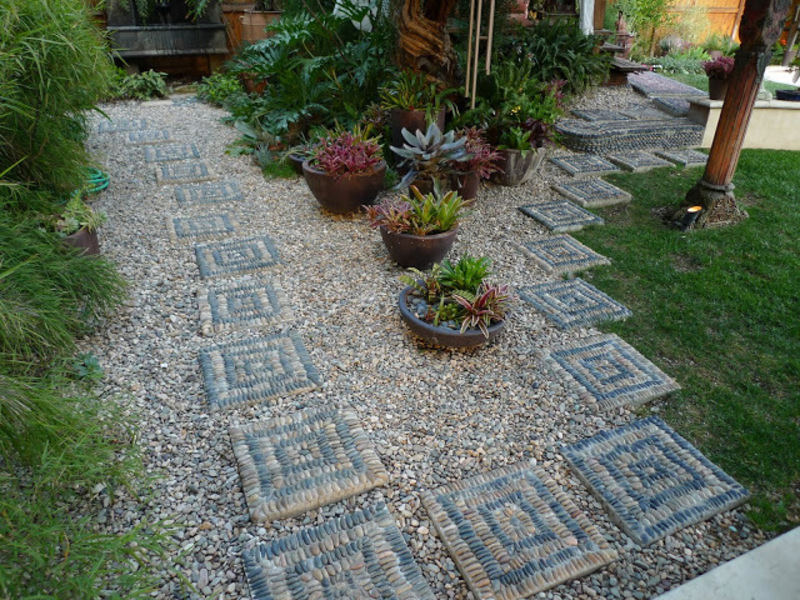 With a carefully planned out set up of light colored rocks, planters of varying types of plants, and an overlay of square, Aztec inspired stepping stones, this landscape design inspires the creativity in all of us. There’s nothing wrong with a simple rock set up, and this design idea proves it. The creek bed itself is simple in shape and design, but is still interesting to look at. It’s composed of a variety of different sized stones, and is outlined with larger, more jagged looking rocks. The large trees around the creek bed give it a calming look. We’re transported back in time with this simple walkway design. The path shape is twisty and curving, while the stones that makeup the walkways entirety are irregular shaped and fit together. The sides of the walkway are tall and uniformly shaped, giving the organic-feeling walkway a bit of structure. 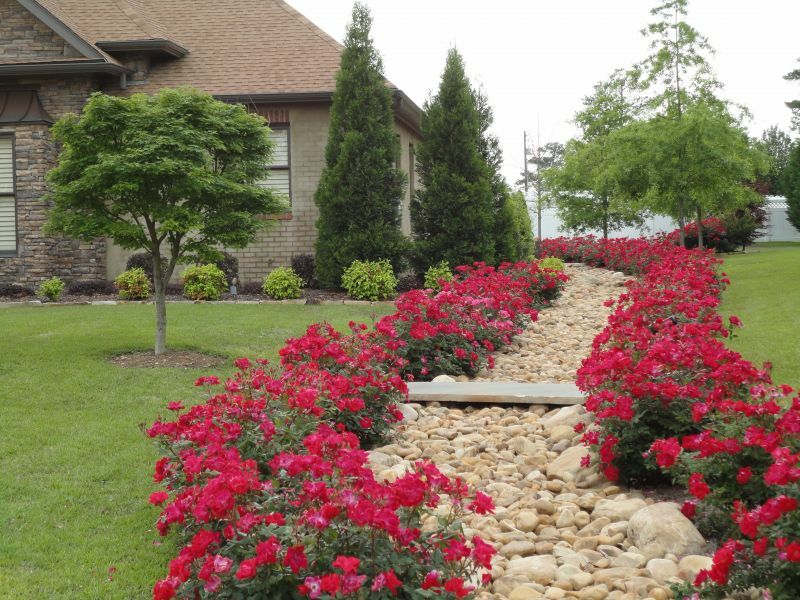 Another great example of how stunning contrasting colors can be, this design can inspire dozens of landscaping ideas. The bed is made beautiful by using dark black pebbles and laying irregularly shaped brown stones over top of them. The stones are set up in two distinct pathways that connect and make a “Y” shape. 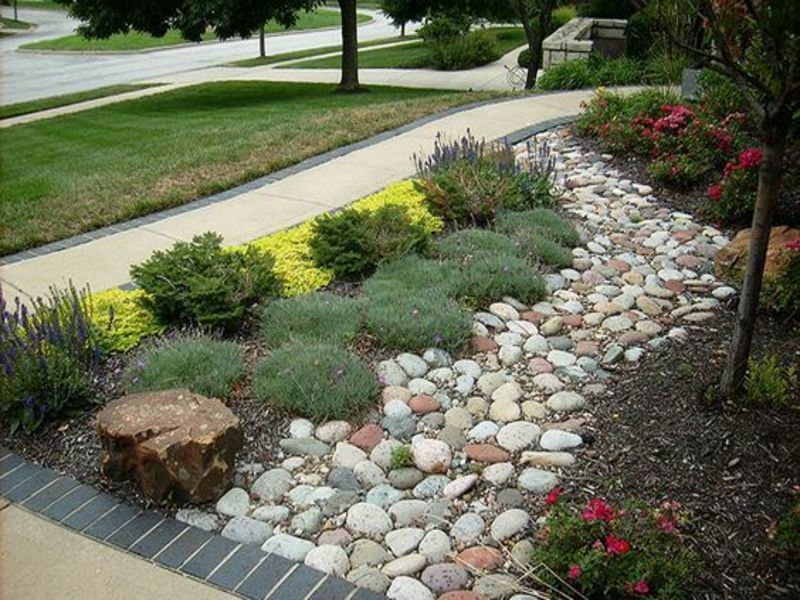 In this landscaping idea, an already beautiful arrangement of basic stones is made better by using brightly colored flowers. The flowers are an eye-catching shade of red, while the stones that makeup the path are light in coloration. The design is finished off with a small foot bridge. 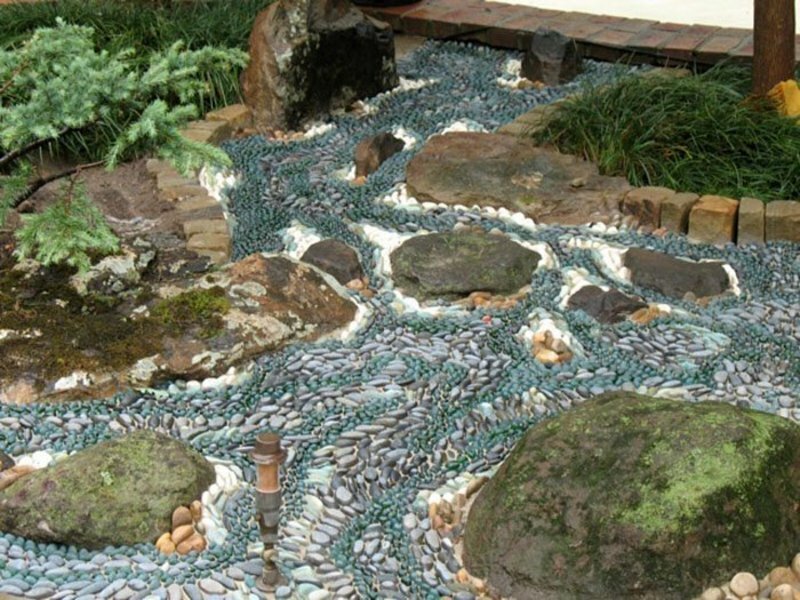 Drawing inspiration from Japanese gardens, this creek bed design is one for the books. 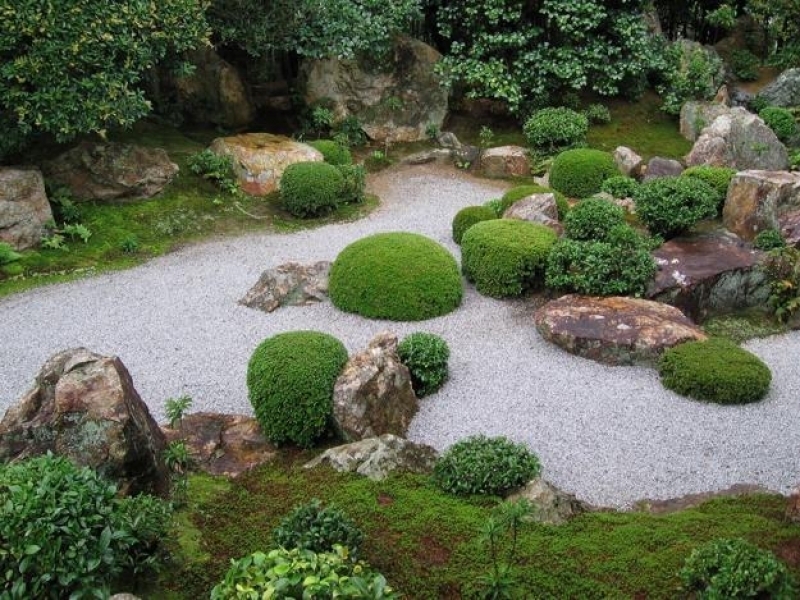 Complete with light-colored gravel and expertly shaped shrubs, the idea takes us all the way to ancient japan. To top it off, it’s complete with large statement rocks that tie the whole thing together. 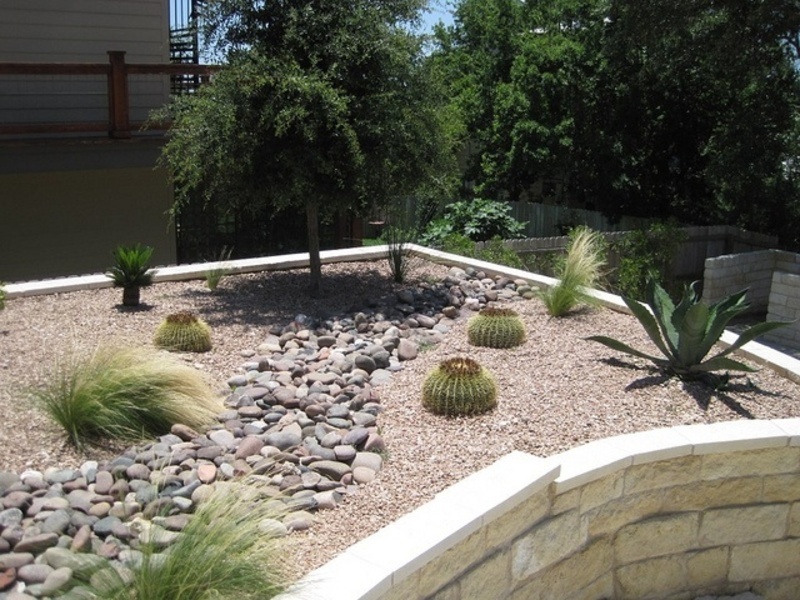 This design fits perfectly in desert backyards that are dry, dusty, and lack greenery. The creek bed is made up of different sized rocks that stand out against the dusty brown background. The bed is lined with larger rocks of varying sizes, and for a bit more pizazz there are solid stone vases set alongside the creek bed. This design looks like it’s out of a story book, but it could be easily recreated with a bit of time and patience. The focal point of the design is it’s blue-black rocks and how they seem to fit perfectly into the scene. Surrounding the rocks is a lush bed of green grass and flowers with foliage surrounding area. This design is unique due to its sharply angled pathway that is made out of a series of curved rocks that alternate colors. The path is bordered by different kinds of greenery and shrubs on one side and soil on the other. 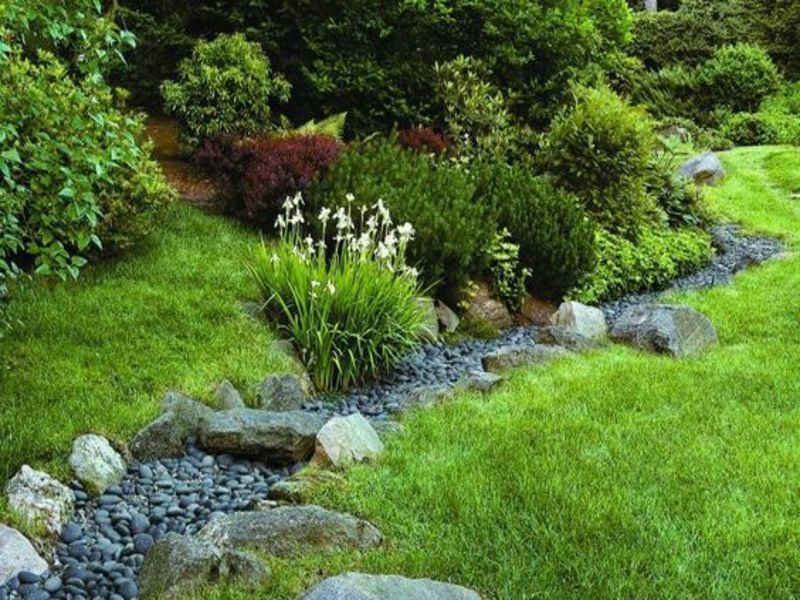 A rock bed like this will give any yard a modern look. 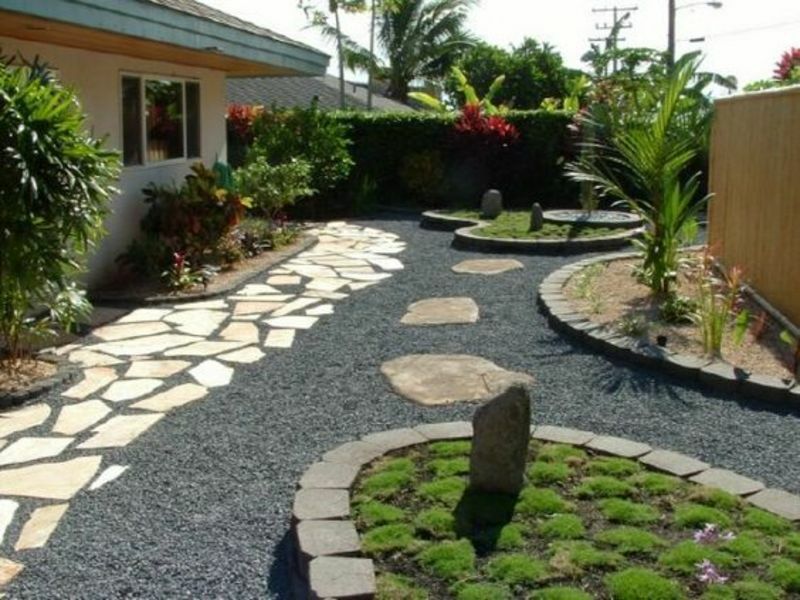 This garden design utilizes two different patterns of rock pathway and gives the design something special. 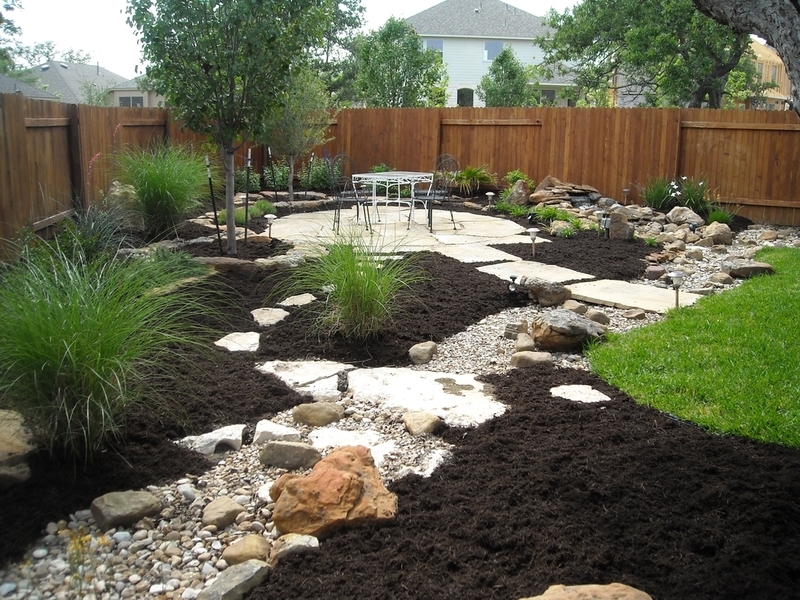 The unique rock patterns go well with the flower beds and sections of greenery within the yard. They look good when compared against the dark rocks that make up the rest of the creek bed. The first idea on our list that uses red as the main color, this design takes advantage of a red color palette that embodies the summer season. 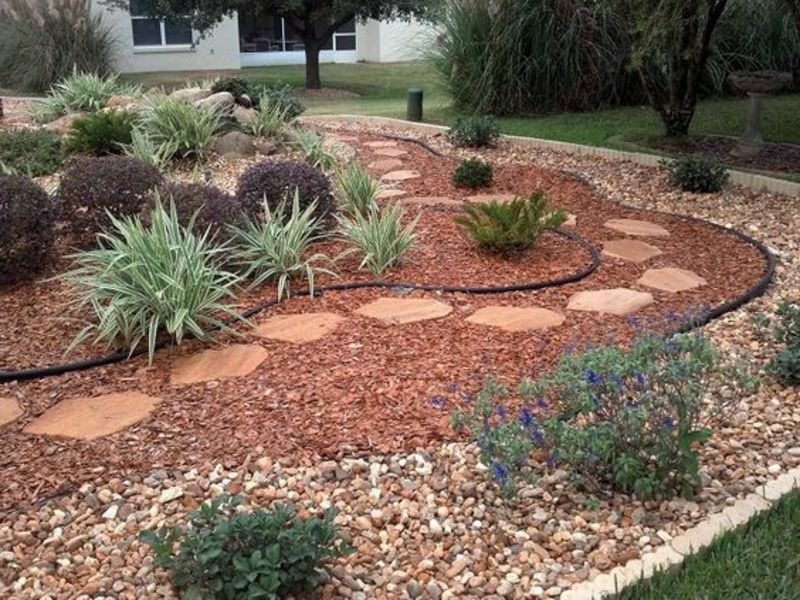 It also uses a mixture of dusty red white and gray pebbles, as well as a variety of plants. A well placed rock bed design can improve the appearance of any outdoor space and the design in this example is no exception. 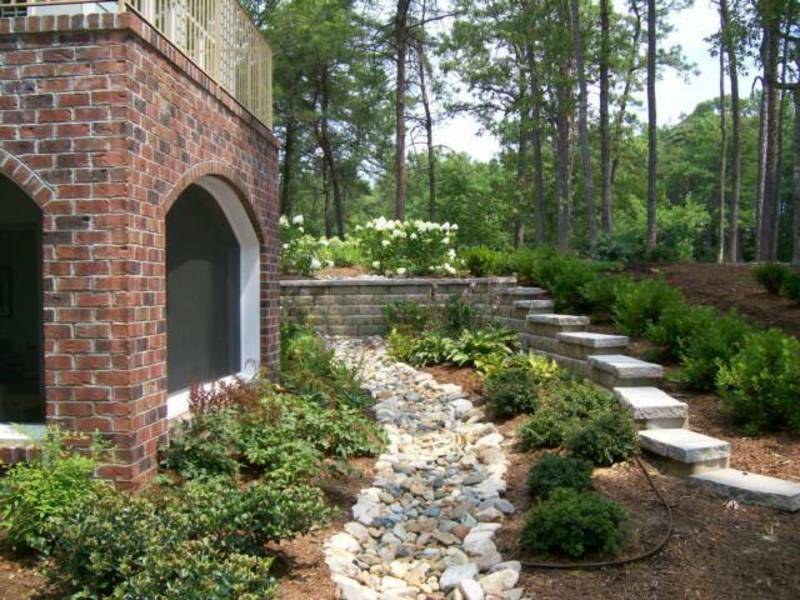 The design uses natural placement and the addition of a cute stone bridge to give this yard intrigue. Simple doesn’t have to be boring with a design like this, as the rock path stands out enough to be noticed from far away. The white stones are emphasized by the black mulch that surrounds the path and the green grass that fills the area. 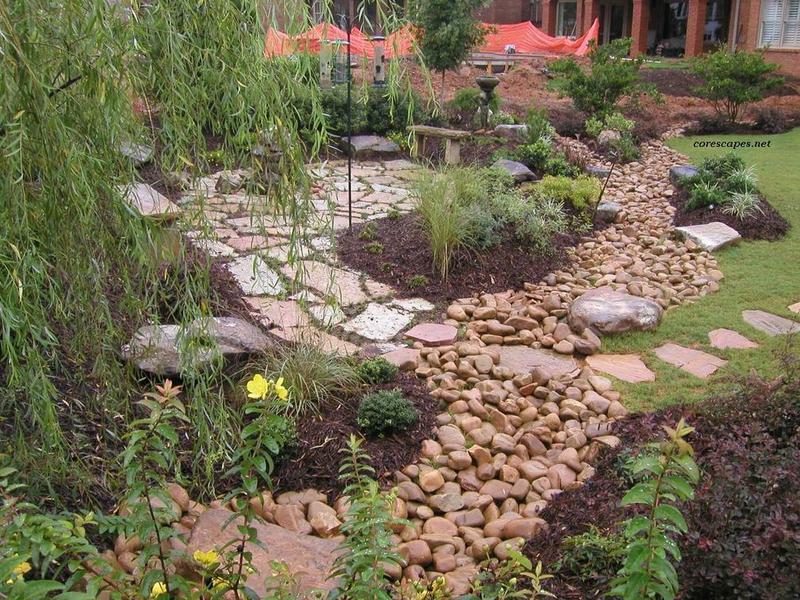 The creator of this garden landscape was using his or her creativity when creating this design. There isn’t just one path but two truly unique paths to choose from when taking a stroll through the garden. Each is made using different rocks and placement techniques which goes to show how much work the creator put into the design. There is a sense of rustic charm that comes from this landscape design. 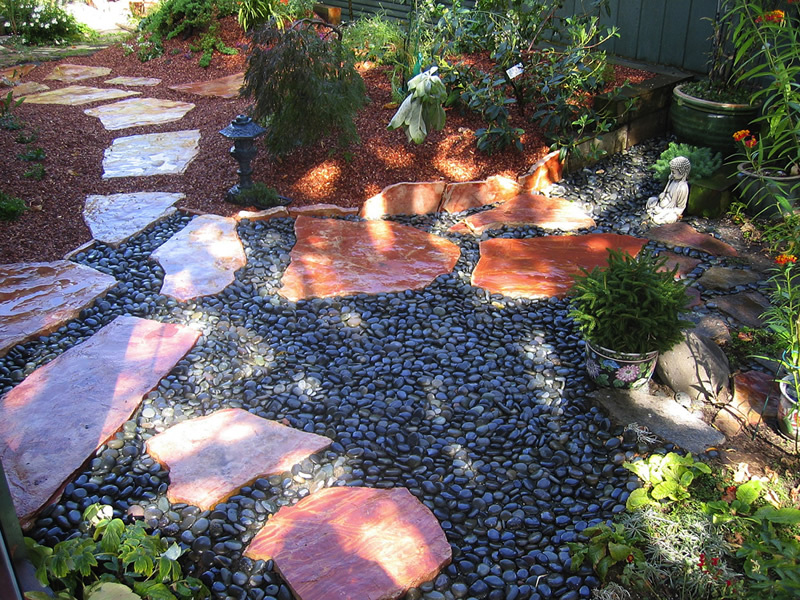 Carefully placed pebbles for an outer lining and large irregularly shaped flat rocks that have natural color patterns to create the pathway that goes through the area. Our 19th design fits into sandy settings like it was made to be there. 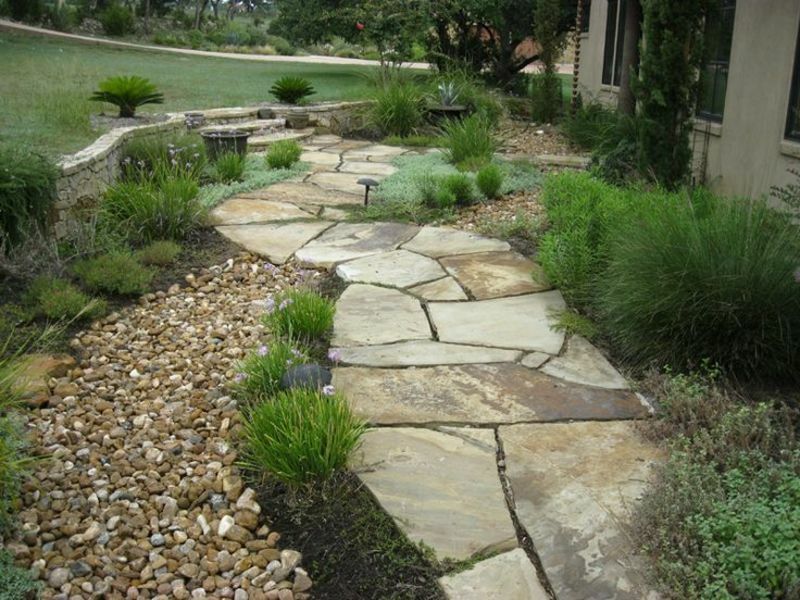 The design, with its simple rock bed pathway, could easily be replicated in other sandy areas or in a grassy setting for an edgier look. 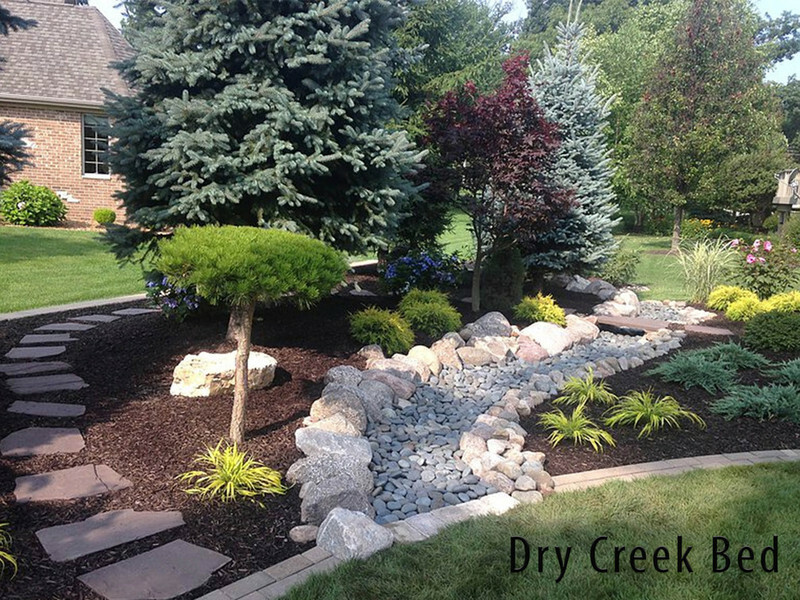 Whoever created this dry creek design took a lot of time to get it set up perfectly, and the time was clearly well spent as the garden is stunning and gives off a relaxing vibe. There are two rock paths that run through the garden, and together, they form a full circle around the circular part of mulch that sits in the middle of the lawn. The whole set up is bordered with various forms of foliage and flowers. 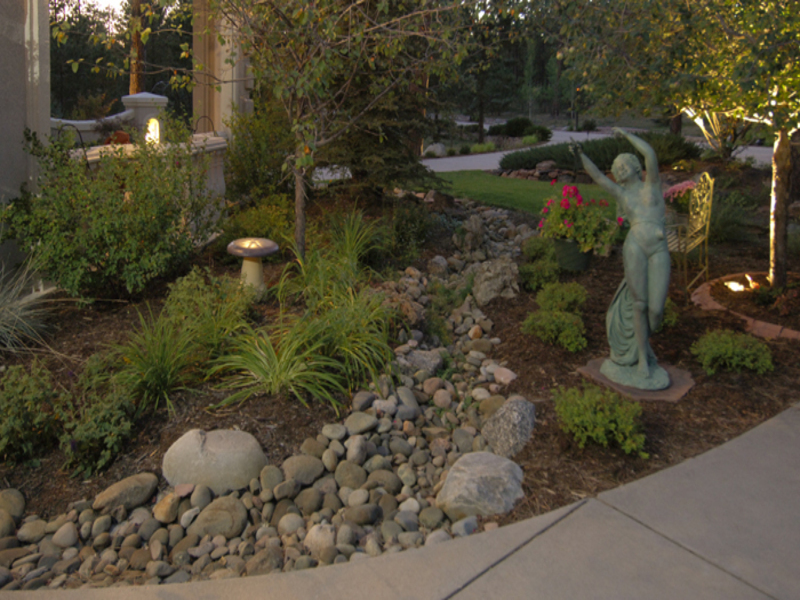 This dry creek design appears to be protected by a serene statue, however, the focal point of it is the beautiful creek bed that goes through the curved area that serves as the garden. The scene is made even more picturesque thanks to the greenery and plant life that line both sides of the path and base of the statue. 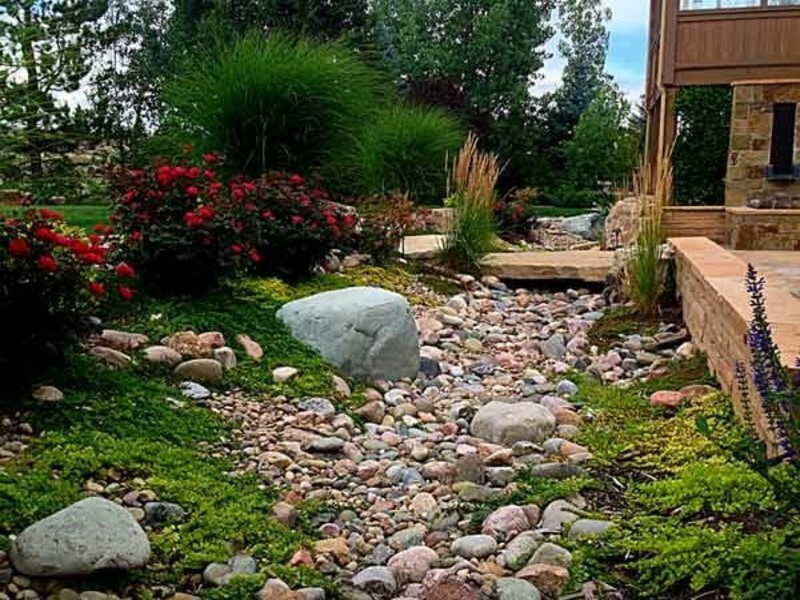 A landscape similar to this is perfect for people who don’t have a lot of room to work with but who still want a charming dry creek bed design. The dry creek is contained within a raised area that is full of small pebbles, greens, and, of course, the dry creek itself. The design is minimalist and beautiful. 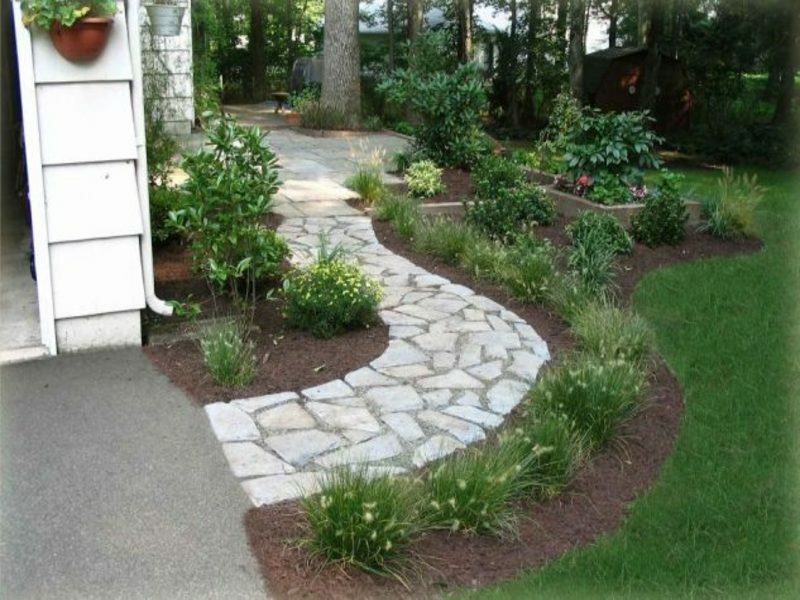 Who knew that the simple combination of mulch and curving paths of white stone could look so good? Not us! This design idea proves that the two, when paired together, create quite the combination. Add a fancy table and chairs to relax in into the mix and you’ve got a relaxation haven. Perhaps the most time consuming idea on our list, this idea is one that could be recreated and tweaked, but would take a ton of time and careful preparation to complete. 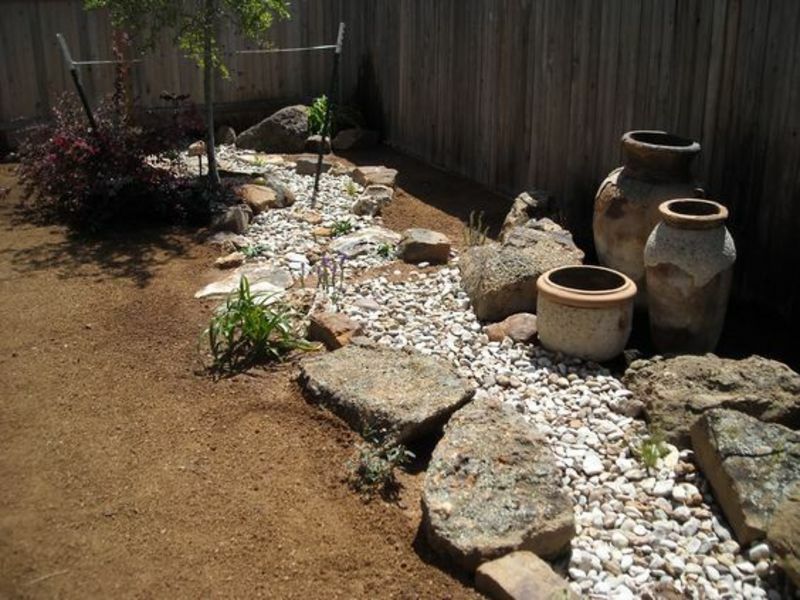 The creator of this dry creek bed used a selection of oval shaped rocks to create an intricate design that spreads over a relatively large piece of land. This landscape idea is one that works well in spaces that already have unique features, such as the stones that appear to be stairs. 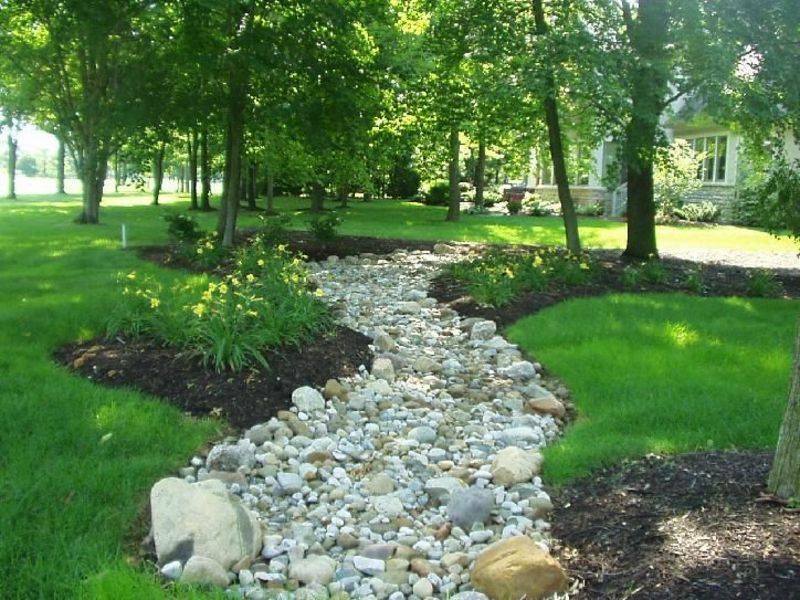 However, the creek bed that runs beside it would look good in any space, as it is classic and timeless. Regardless of where it is used, the area is guaranteed to look expensive. 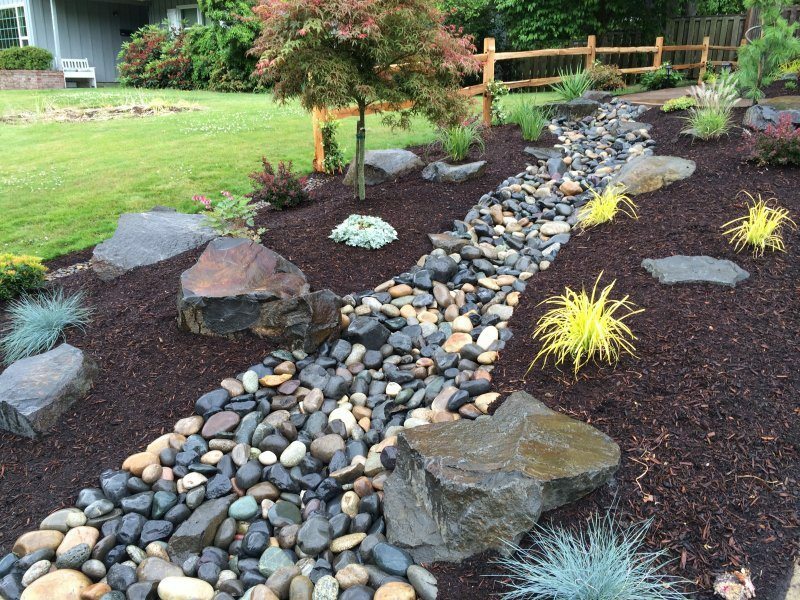 There you have it, 25 stylish Dry Creek Bed Landscaping Ideas that are sure to please the neighbors.. Have a landscaping tip or photo to share? Join our facebook fan page and tell us about it, here.